Veteran Maryland rock quartet CLUTCH is putting the finishing touches on its ninth studio album, titled "Strange Cousins From the West". Produced by CLUTCH and J. Robbins at Magpie Cage Studios in Baltimore, the effort is the first CLUTCH studio LP to be released on the band's own Weathermaker Music, through RED Distribution. It will be available both digitally and through retail on July 7. The first single and video, "50,000 Unstoppable Watts" will be officially released prior to Memorial Day weekend. "Strange Cousins From the West" includes the POPPO'S BLUES BAND cover song "Algo Ha Cambiado", which CLUTCH vocalist Neil Fallon sings in Spanish. Poppo was a legendary Argentinian hard rock singer/guitarist throughout the '70s and '80s. The title "Strange Cousins From the West" was taken from a line in the song "Minotaur". 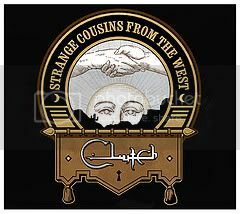 Although CLUTCH has toured the world extensively over the past two years and released multiple CLUTCH-related projects, "Strange Cousins..." is the band's first original studio work since 2007's "From Beale Street to Oblivion" which featured the hit "Electric Worry". CLUTCH is planning a seven-month worldwide headlining tour which takes flight in the U.S. on May 6 with support acts WINO and MAYLENE & THE SONS OF DISASTER, followed by a July U.S. tour with BARONESS as main support. Look for the band to appear on some popular music and art festivals, including Austin City Limits later this fall, U.K.'s mammoth Download festival on June 14 and more to be announced.